Note: This post is probably better on desktop where this consideration could make a difference. Watch the GIF. See that text box that appears in the bottom left when I hover over an affiliate link? It’s nitpicky, but I bet it’s something more seasoned internet users are used to doing. 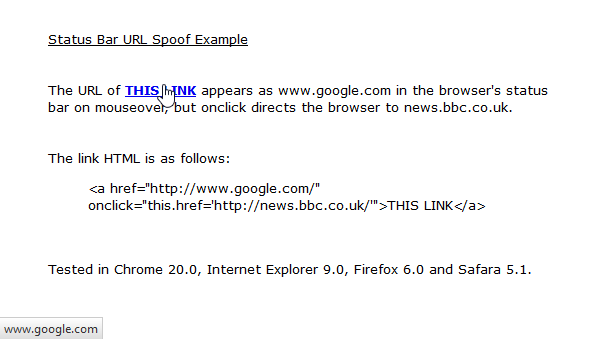 Today we’re going to spoof it so that the destination linklicious.co appears onhover, rather than ohgm.co.uk/nope/linklicious. Click the link, watch the headers. Going by the status bar, the above link appears to lead to ‘linklicious.co’. Viewing the HTTP headers we can see that it actually goes through a redirect on this domain first. This would fool the majority of internet users. Which works perfectly, in isolation. Rather than edit functions and using our brains, we’re going to install a plugin. The one I’m using here is helpfully called ‘Code Embed‘. It allows us to embed code using custom fields in WordPress. Monsterinsights is adding an onclick event to all external links to track them. This invalidated the onclick event we want to append, meaning your affiliate offers would be bypassed entirely. Increased CTR without the possibility of conversion. I understand that this will be a deal-breaker for some people. Tracking is really important to people with good websites. I’m sure some of my smarter readers can have both. This is actually less deceptive than the process most affiliates already employ (a link to a redirect hosted in a folder blocked in robots.txt). Redirects are not transparent (they could go anywhere) – here we’re at least being honest about the domain we’re sending them to (just not the full URL with the affiliate query parameter). This could be used for obviously deceptive ends . Have fun! This will harm conversions more than help them (seriously), so I won’t be implementing this anywhere until the glaring issue I’m thinking about is resolved. This is also clearly terrible SEO. Cool idea. Some very interesting points, thanks for the post.